I reach almost all the way back and throw almost all the way over the top, is this proper mechanics? It is comfortable for me, and I can throw about 68-72 mph. (I’m 14 and 6’ 145) I was wondering if “slingshotting”, with using my elbow could help with speed, or how much. Is it worth it when I’m comfortable pitching this way? 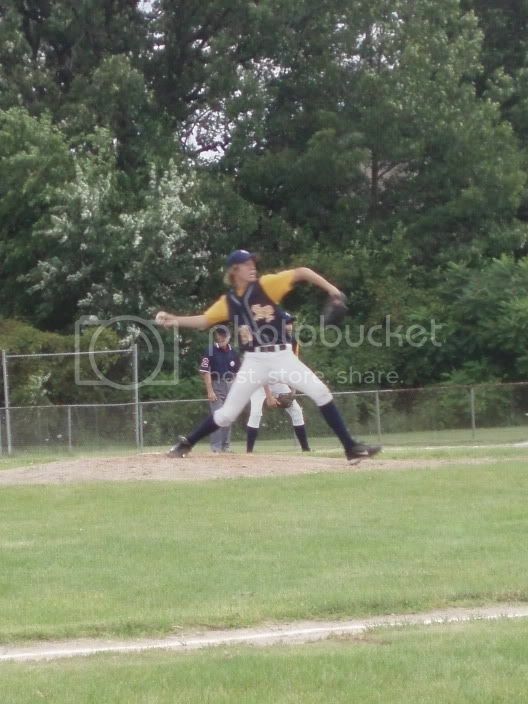 Pitching arm elbow should be about shoulder height at foot plant, with the forearm vertical or close to it. Your hips don’t look like they have rotated at all. Your hips should rotate right before foot plant while your shoulders stay in a line to home plate as long as possible. Generates power, takes stess off of arm. It’s hard to tell though, since it’s a stop photo. It would be better if you could post a video of yourself. I think the height of his elbow is fine. It’s just below the level of his shoulders, which is pretty much ideal. This isn’t immediately obvious since he is dropping his back shoulder slightly. …with the forearm vertical or close to it. I definitely agree that the forearm isn’t vertical enough at this moment. It looks like he is rushing a little in this photo, which can put excess strain on the shoulder. He might want to try breaking your hands slightly sooner, which will allow his arm to get up and into the Ready position sooner. I’m not sure if I agree. His hips have rotated some, but I agree that it’s probably not enough. I think the problem is that his foot is still parallel to the rubber at this point. I would prefer if he was more on his toe. He hasn’t rotated his hips enough, much closer to facing 3rd base instead of home plate it looks like to me. A video or another view would help to clarify that. I do agree that his back foot shouldn’t be parallel to the rubber, but starting to move off of it at that point. Also, I just noticed that your back leg is bent too much in my opinion. If it is more extended you’ll get more power out of your lower body, as it is another thing that helps to stretch the legs and torso muscles. I just thought about it again, and I don’t think that picture will help, because its not clear which part of my stride I am in. It’s not useless, because you can still tell your about to plant your stride foot, but it makes it difficult to tell exactly where your pitching arm(among other things) would be once the entire foot is down. Hips look fine. Elbow height looks fine. Back foot looks fine. Back leg bend looks fine. video is a must to actually discern whether the overall timing and tempo is correct. About the reaching straight back issue. It isn’t necessarily bad but it can be, if improperly done. The question I have is why do it? It does nothing for power, if that’s what someone has told you it’s for or if you think it’s for power. Nothing. Chris mentioned timing of the arm action. My experience has been that those who exhibit this arm action often let it “hang” there at the top while the rest of the body catches up. This causes any energy just built up to be dissipated and you must now start all over again getting energy into that arm. The other problem I see in this arm action is the fact that the path gets on a second to home plane orientation. Some, not all but some, pitchers who do this allow the hand to continue on that path much too far and end up bringing the ball/hand in close to the ear before then having to change that path to what the ball/hand must do to throw. As most here by now know, I prefer and recommend a different hand path, one that’s similar to the vast majority of MLB pitchers, that being a horizontal W, whipping arm action. Give us some video. Up to now it’s all very speculative. Be careful again with photos. Post a video if you can. In this photo you have a tilt and at foot strike I’d like to see where your elbow is but it does look fine. Also do you take the ball out with your hands or your elbows? At 6’0 145 you have "potential " at your side. With the help of this website and others you can definitely maximize your pitching. Definitely see about getting someone to video tape your mechanics from all four sides. Also, since you are a tall fellow you might get more from your stride, again with a photo we do not know if you are going to land or ride your front side a bit more. Do we know if you are about to land with a stiff front leg or are you going to have significant bend. We don’t know, we just don’t know. This is something I am having issues with my son. Do you land on your heel or are you about to land of the ball of your foot? [quote=“SPallstar21”]I just thought about it again, and I don’t think that picture will help, because its not clear which part of my stride I am in. I have 1 concern. Your hand placement on the ball. It looks like your hand is coming under the ball rather than staying on top of the ball. This can cost you several MPH. It looks to me like his hand is to the side of the ball, which would be good (under the ball at this point would be better). There is no point in trying to keep the hand on top of the ball at this point, and trying to do so could cause problems by forcing you to pronate the forearm too soon. I wish I could get my video onto the comp, any ideas on how too? I have myself videotaped on a VHS tape from a pitching lesson at Amherst College with the head coach Bill Thurston. My hand comes underneath the ball, and he says from that point I have to catapaullt the bal rather than being able to generate power. My hand never comes to the cocked position with my fingers on top of the ball and the ball pointed to the 3B or SS area. He gave me a few drills to do where I have my fingers on top of the ball the entire time. But anyways, would you know of any way I could get my VHS tape online? I wish I could get my video onto the comp, any ideas on how too? I have myself videotaped on a VHS tape from a pitching lesson at Amherst College with the head coach Bill Thurston. There are cards out there that will let you capture video from your VCR and transcode it to a PC format. However, your money (c. $200) would probably be better spent on a digital camera that can also take short video clips (preferably saving them in the QuickTime .MOV format). As the shoulders start to turn and the upper arm externally rotates, EVERY pitcher’s hand ends up under the ball. My concern is that he may be telling you to fix something that isn’t broken. It is PHYSIOLOGICALLY IMPOSSIBLE for a pitcher to keep their fingers on top of the ball throughout the throw (and I wish pitching “gurus” would stop telling people that they need to always have their fingers on top of the ball). …and he says from that point I have to catapault the bal rather than being able to generate power. My hand never comes to the cocked position with my fingers on top of the ball and the ball pointed to the 3B or SS area. First of all, every pitcher “catapults” the ball to one degree or another. Second, there is a tremendous amount of variety in the arm actions of pitchers. Not everyone comes to the traditional high cocked position. He gave me a few drills to do where I have my fingers on top of the ball the entire time. I think these drills are dangerous because they teach you to do something that is neither necessary nor a good idea. [quote=“Chris O’Leary”]…your money (c. $200) would probably be better spent on a digital camera that can also take short video clips (preferably saving them in the QuickTime .MOV format). [/quote]The thing to watch for here is frame rate. Most digital cameras allow about 15 fps. The HP R707 has 30, which is the VHS rate. Basically, the more the better. 30 fps is minimum. Pay a bit more and you can get 60 fps. Olympus makes one. [quote=“Chris O’Leary”]It is PHYSIOLOGICALLY IMPOSSIBLE for a pitcher to keep their fingers on top of the ball throughout the throw (and I wish pitching “gurus” would stop telling people that they need to always have their fingers on top of the ball). [/quote]I highly doubt that “gurus” out there actually say “always”. That’s ridiculous. It’s during the windup that this is recommended. [quote=“Chris O’Leary”]Not everyone comes to the traditional high cocked position. [/quote]The vast majority do or at least come very, very close. It’s how they get there that differs. I’m not sure I’m understanding this discussion. At what point in the delivery are we talking about getting the fingers on top of the ball (or not)? I’ll have my friend tape me next time I pitch. I have a digital camera that can video tape. But, the problem I have is when my lead foot plants, my shoulders are already opening, and my hand is completely underneath the ball. I was gunned at 70. He said I should be throwing harder for my size and age (5’10.5" 215lbs 16yrs old). But, do you think my delivery is the cause, or just that I haven’t been playing baseball all that long? I played baseball in 6th grade, then not again until 9th grade. So could the lack of velocity just be because I haven’t developed like everyone else? I’ll try to get a video up tomorrow. Some gurus will tell you that the fingers should always be on top of the ball. That’s neither physiologically possible nor a good idea. I don’t think the fingers should ever be on top of the ball except at the high cocked position and at the release point. Here’s the root cause of your velocity problems. …and my hand is completely underneath the ball. It won’t impact your velocity significantly. But, do you think my delivery is the cause, or just that I haven’t been playing baseball all that long? I played baseball in 6th grade, then not again until 9th grade. So could the lack of velocity just be because I haven’t developed like everyone else? It probably has something to do with your physical maturity, but it’s mostly due to a mechanical problem (hips not rotating ahead of your shoulders). You could have this problem because you haven’t played much. It’s something you have to learn to do. I thought it was weird. He told me that my cocked position is bad because Im underneath the ball not on top of the ball. But, he also said that despite my shoulders being open, upon release of the ball my arm was in a perfect arm slot to be a power pitcher and that I had a good release point. But, he also said that despite my shoulders being open, upon release of the ball my arm was in a perfect arm slot to be a power pitcher and that I had a good release point. What does “a good release point” mean to you? Too many coaches say things like this. They sound good but they’re really meaningless. To me, a good release point is one that is about your forearm’s length in front of your front foot and which is consistently located from pitch to pitch and for all pitch types. If you’re opening up the shoulders too soon, I doubt your release point is as far out in front as it could/should be.